Last month, almost 1000 mouth blown glass baubles descended on me just in time for the Christmas season. I'm excitedly filling up my diary with events where I will be personalising these on the spot and serving them up in gift boxes ready to be taken home and put under the tree! Painting on a glass ball is kind of different to lettering on a flat wooden surface ( !!! ) but it's a challenge I enjoy non the less! How I came to be doing this starts a few years ago in Australia when I answered a gumtree ad which called people to take part in a sort of bauble painting audition which could lead on to a christmas temp job personalising baubles in a shopping centre. As I was always looking for short term jobs whilst I was living in Melbourne, I went along and found myself at a man's apartment with 6 or 7 other girls ( we were definitely all thinking how bizarre the situation was, as this stranger had us sit at his kitchen table and instruct us on painting glitter onto baubles ). I found it actually quite natural to paint something you could hold and turn in your hand, and by the end of the 'audition' got asked to stay behind and was employed with immediate effect! I was sent to Australia's largest shopping centre and there, would paint baubles all day long for families, couples, baby's first christmas, dogs, teachers etc etc etc. It was so full on and exhausting especially in the last few days leading up to christmas when the store was open 36 hours straight ( I didn't stay for the duration but some people did..! ). For those 2 months everything I seemed to touch, wear and eat would be speckled in glitter. Worse than that, was that even just talking to people seemed to transfer the glitter on to them and I found myself involuntarily becoming some sort of glitter ambassador ( I don't even like glitter ). Anyway, when I returned to home soil in 2015 I decided I should take my hours of bauble painting experience and start producing and selling my own. So here we are, a branch from my sign painting tree! No longer a cog in someone else's multi shopping centre machine, I am a one man band trying to spread the personalised festive joy one bauble at a time! This morning I had an order from a lady celebrating her 5th wedding anniversary, but this was no ordinary lady... This lady, ( lets call her by her name - Christina ) was one of my first wedding sign customers ( and indeed the maker of this here website ) and if it's her anniversary, well then it must be Lesser Than Three's anniversary too! I hadn't even realised and to be honest hadn't marked the date ( or even month ) that I had began this venture which started so casually and now is such a huge part of my life. 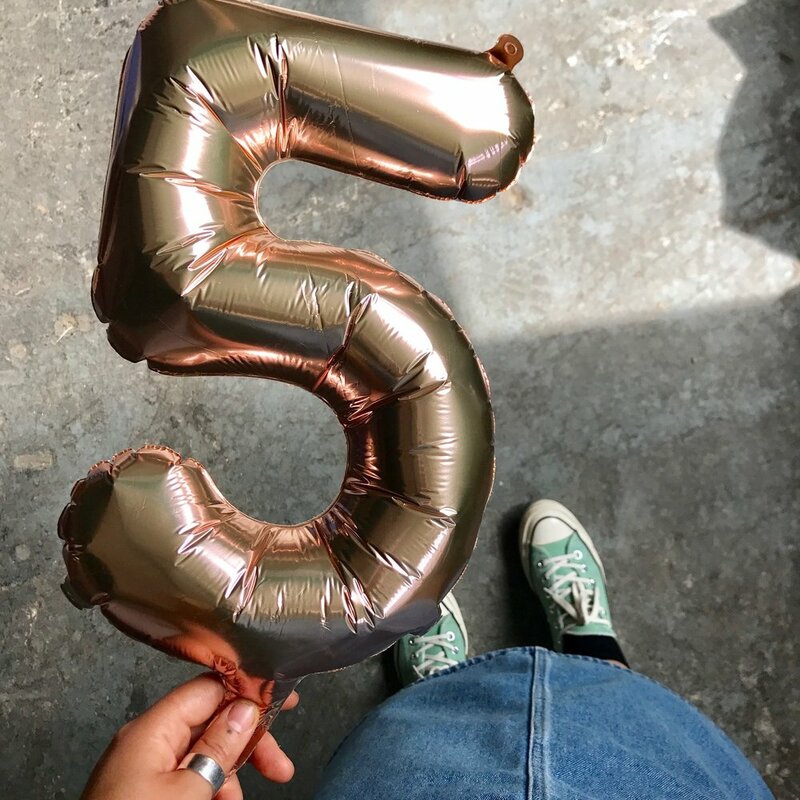 So somebody get the candles out because this week marks 5 years of making signs and gifts for people and wow I could get reflective here but I'll try and hold it in! I'm so super grateful for everyone that trusts me with their wedding signs, anniversary gifts and every custom job in-between, Thanks so much. To celebrate I'm offering 10% off all items in my shop until midnight 25th August! Use code HAPPYBIRTHDAY5 at checkout to redeem the discount! What's more is you can get 15% off by reposting one of Lesser Than Three's product photos on instagram OR posting one of your own images of a Lesser Than Three item and tagging @lesser_than_three and I'll DM you the coupon code!